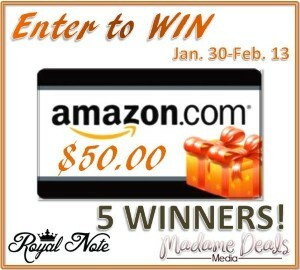 We’re giving away another $50 Amazon Gift Card thanks to us teaming up with Madame Deals Media and RoyalNote! RoyalNote is a great way for you to save some extra money through their awesome flash promotions. Enter to Win (5) $50 Amazon Gift Cards! Giveaway will run from Jan. 30th at 12:01 am EST and end on Feb. 13th at 11:59 pm EST. Winners MUST register for RoyalNote in order to be eligible to WIN. RoyalNote is an INVITE ONLY site so Giveaway Bandit fans can click join RoyalNote here in order to register. Register now and then head into the Rafflecopter to complete your entries.